Welcome to the website of Out & About – No. 1 for Vinyl and Laminate Flooring and quality assured Carpets in Bramhall. Our personalised service couple with our unique “choose at home” service ensures you can pick the perfect flooring and carpets from the best place possible – the comfort of your own home. Quality Laminate, Vinyl Flooring and Carpets in Bramhall from a company you can trust. Quality assured carpets in Bramhall. Choose from a wide range of brands, styles and colours. Because we bring samples to your home you can make a better judgement as to how your new carpet will look. For vinyl flooring in Bramhall, we offer a wide selection of options for this popular choice. Perfect for the busy family home – there are lots of styles, designs and colours to choose from. And you can make choices from the comfort of your home. Looking for laminate flooring in Bramhall?Our flooring is a popular option for those who are looking for a stylish aesthetic for their flooring – and are easy to clean. With lots of styles, colours and quality to choose from, you can’t go wrong. Here are a collection of client case studies of supplied and fitted carpets in Bramhall and across Greater Manchester. We have fitted miles of laminate flooring in Alderley Edge homes over the years. Have a look at our gallery to see how fabulous this durable, easy-t0-maintain flooring is. Vinyl flooring is one of the most durable, easy to maintain and popular flooring solutions for homes in and around Alderley Edge right now. Because Out & About is a ‘choose at home’ service, we can not only offer to you an extensive range of carpets, vinyl and laminate flooring to compare, but we will assist you in making the best choices for your surroundings. Our friendly staff will advise rather than persuade ensuring you are making informed decisions. This has helped us become one of the most sought-after supplier of flooring and carpets in Bramhall. Because our overheads are low, we can provide not only fantastic products but fantastic prices – as we pass our savings onto you, giving you far more value for your money! Where better to choice flooring or carpets in Bramhall than your own home? With Out & About Carpets we guarantee that you will only get the finest quality products and service. Our aim is to provide quality flooring and carpets in Bramhall homes by offering you the chance to choose from home. This means you can pick your flooring or carpets and match to your decor and lighting without any guesswork. And our clients love this! See our testimonials below or any of our online reviews. 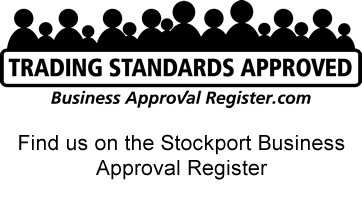 To back this up, our recent listing in the Trading Standards “Approved Business Register” for Stockport is a testament to the level of service we provide and the reputation we have earned. Looking for carpets in Bramhall? Laminate or vinyl flooring? We want to hear from you.